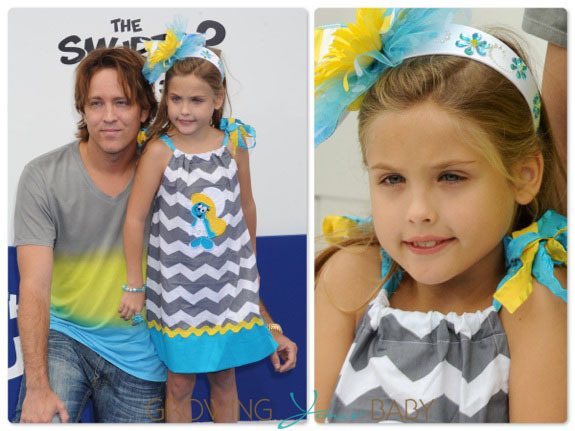 Home » Larry and Dannielynn Birkhead Attend The Smurfs 2 Premiere! Dannielynn Birkhead was as pretty as Smurfette at the Smurfs 2 Premiere held at The Regency Village Theatre in Westwood, California on Sunday(July 28th). The six-year-old posed for the cameras while wearing an adorable chevron pillow case dress that was embroidered with Surfette on the front. To complete her look she wore a rhinestone encrusted headband that was adorned with a yellow and blue flower. Not to be left out Larry wore a blue, yellow and grey shirt that matched his daughter’s ensemble perfectly! During a recent interview with ABCNews Larry revealed that being a single dad is tough. ‘Is she spoiled?’, he was asked. ‘She used to be spoiled.’ he replied. We think he’s doing a great job. Dannielynn always looks super cute while out at public events!